Happy Friday! Hope you're doing well! Another spring like week here in PamKittyVille. Sunshine and rain both, very nice. The dose of sun between storms has really helped. So did a nice day sewing with friends. I feel grateful when I am included. Patty hosted and I she gave me a tour of her beautiful gardens, full of drought tolerant plants that have loved this rainy season. Check out the amazing Banksia I posted over on Instagram. I need to grab up one of these plants this season, it's so cool. 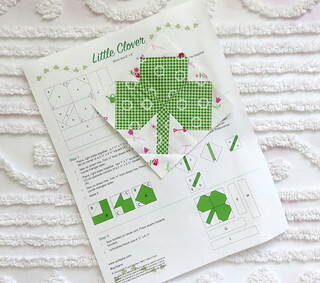 Did you see this cute little clover block over at The Splendid Sampler? DYING OVER IT. Designed by Jane its so darn cute I can't stand it. You can click over here and grab your pattern. I still need to add my log cabin style sides to it, but I just love how cute and small this is. And green.. I'm in love with green these days. I too love this block! 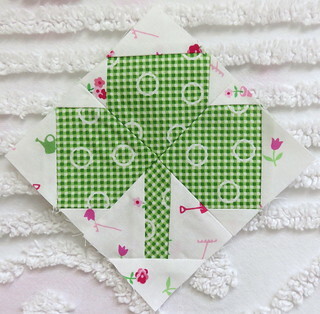 Love it with your green gingham fabric - so cute!! There is nothing nicer than sewing with friends, except sewing with friends and eating CAKE of course, giggles.